Explanation: Supernova remnant Cassiopeia A (Cas A) is a comfortable 11,000 light-years away. Light from the Cas A supernova, the death explosion of a massive star, first reached Earth just 330 years ago. The expanding debris cloud spans about 15 light-years in this composite X-ray/optical image, while the bright source near the center is a neutron star (inset illustration) the incredibly dense, collapsed remains of the stellar core. 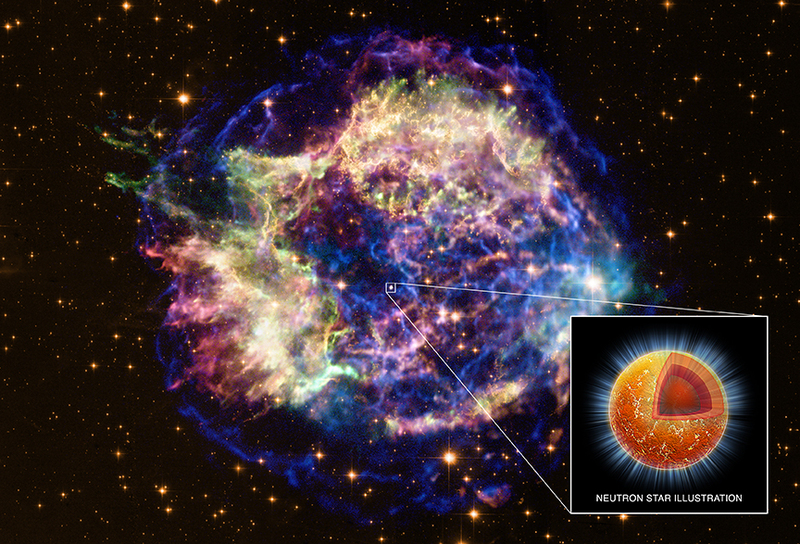 Still hot enough to emit X-rays, Cas A's neutron star is cooling. In fact, 10 years of observations with the orbiting Chandra X-ray observatory find that the neutron star is cooling rapidly, so rapidly that researchers suspect a large part of the neutron star's core is forming a frictionless neutron superfluid. The Chandra results represent the first observational evidence for this bizarre state of neutron matter.